AppleScript enhancement utility for Ircle. Is there a better alternative to IRCmagic? Is IRCmagic really the best app in Chat category? Will IRCmagic work good on macOS 10.13.4? IRCmagic is the successor of MacWaveOut - an AppleScript enhancement for the popular Mac IRC chat client, Ircle. 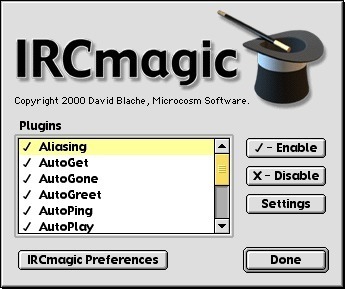 Among IRCmagic's built-in features are many handy IRC-related features like custom CTCP replies, powerful input line aliasing, and fully-configurable sound synchronization functions like AutoGet and AutoSend. Also included is a full-featured Jukebox that plays your sounds unattended, sound management functions such as AutoPlay and automatic labeling, and many other useful features. All of IRCmagic's built-in features are fully configurable, and easy to use. IRCmagic needs a rating. Be the first to rate this app and get the discussion started!